I’ve been itching to go to the beach since I started to feel the burning heat in the metro. 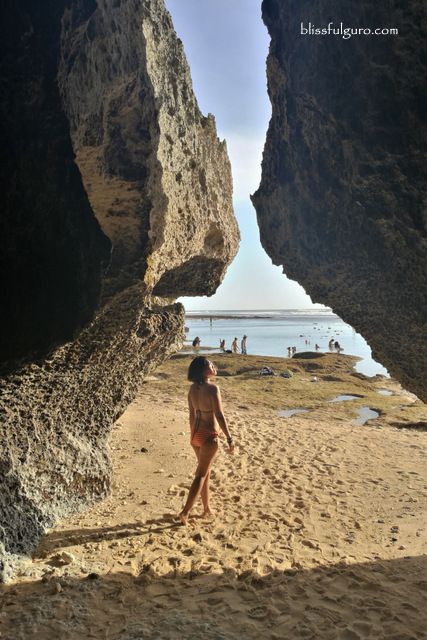 So when me and my buddies were in Bali, I devoted a day and a half to check out some of the nice beaches on the island; one of which really captivated me that I instantly stripped off and ran to the clear turquoise waters like a child. 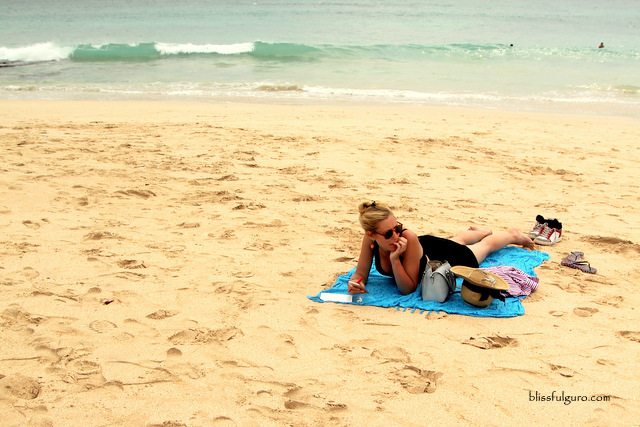 There are more or less thirty four beaches in Bali, and those are just the major ones. 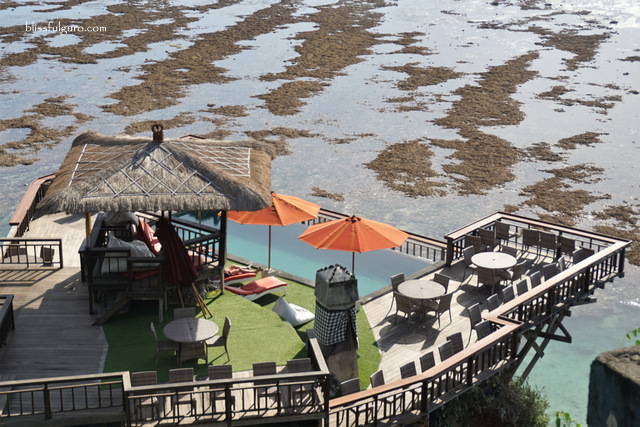 Surrounded by Indian Ocean and Bali Sea, the 5,780 sq. km. island is truly a beach paradise and it would be such a shame to miss it (check here for discounted tours, transportation and activities in Bali). Our uber cool driver/guide, Made, from our first day of tours in Bali picked us up on time at our home in Ubud. 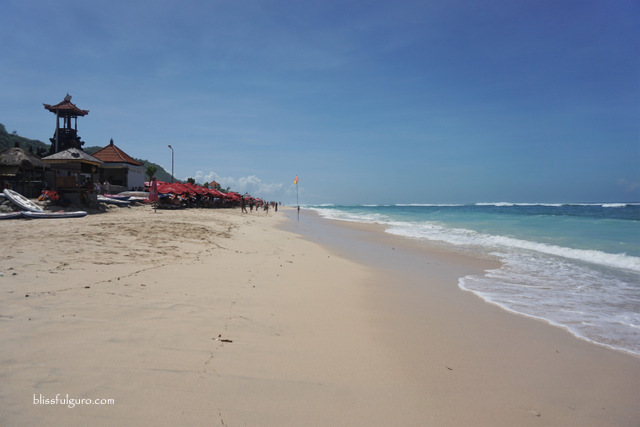 We specifically wanted a day of beach exploration and the guys from Bali Golden Tour happily fixed our itinerary for that day. We opted for a private tour which is quite cheaper than joining group tours. 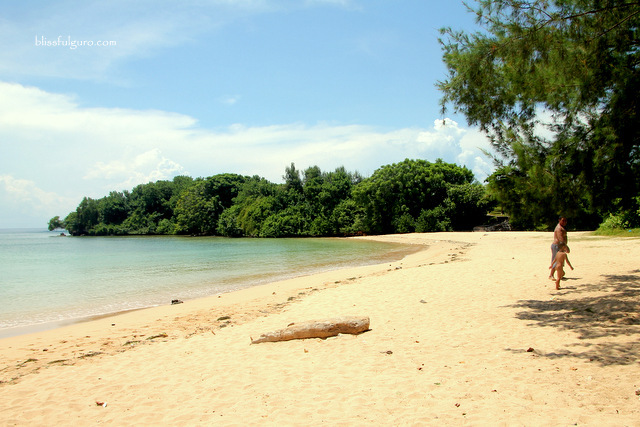 First was the beach near our home in south Kuta, the German Beach. 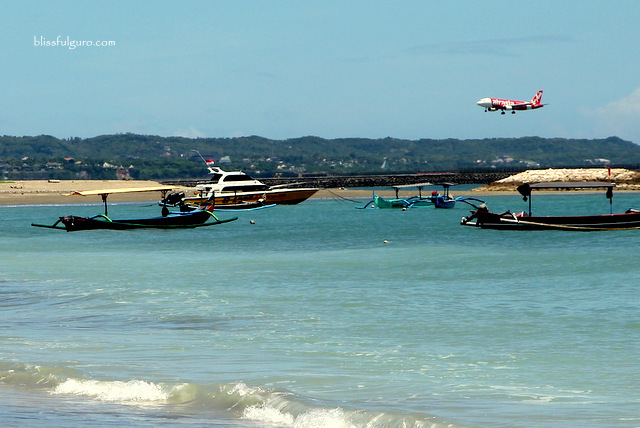 Locally known as the Pasih Perahu Beach, the German Beach is located near the Ngurah Rai Airport runway thus; huge aircrafts are commonly seen on its horizon. The name is derived from the airport construction workers (mostly Germans) who lived in this area a few years back. The twelve-o’ clock sun was burning our skin as we strolled from Rama Beach Resort & Villas to the beach. It took us ten minutes to finally reach the wide empty shore. 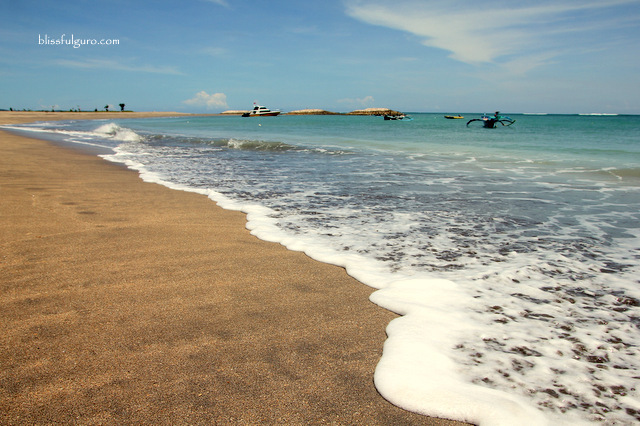 The sand was coarse and grayish while the huge waves were dragging the parked jukung or traditional boats on the shore. The beach was empty. A round of afternoon beer sesh would've been perfect but we couldn’t find any. I wasn’t convinced to jump into the waters as well so an afternoon stroll followed. 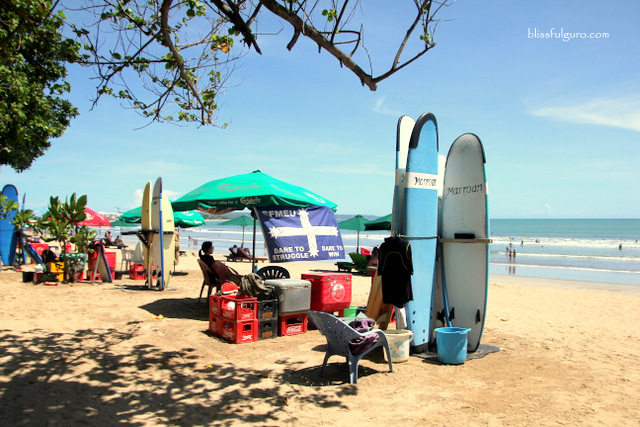 Next beach on the list was Kuta Beach found near the city center. 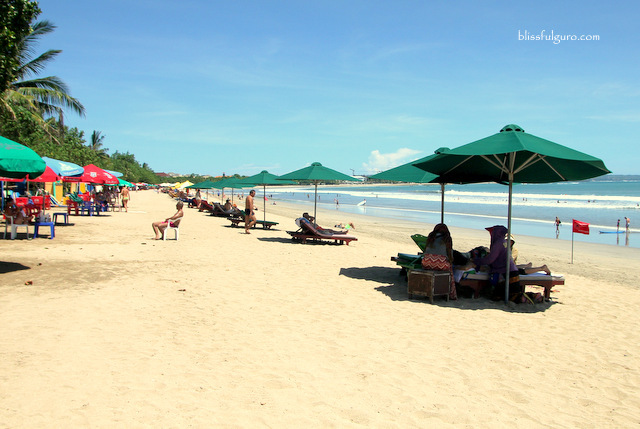 Considered as the most popular beach in southern Bali, the commercialized area right across Kuta Beach makes it accessible to tourists and locals alike. The neighboring hotels, restaurants, clubs and shopping centers make the beach lively during the day. Swimming is discouraged here due to strong ocean currents and high waves – perfect for surfers. The coarse sand is rather gray, well, if you're thinking about white sandy beaches of Bali, this is not the place to chill. Me and my buddies haggled for a cab ride from our hotel to Kuta Beach (60,000 Rupiah | US$ 5) and were dropped off at a shopping center. 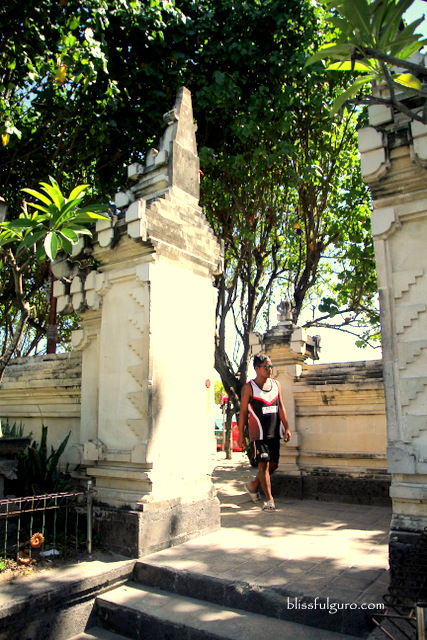 We went across the narrow road and passed through a nice Balinese gateway where we were transported to the tropics in no time. 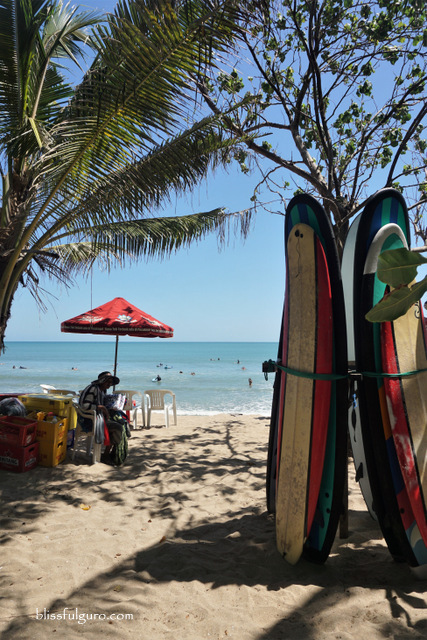 Huge trees, surf stands and makeshift beer shacks dotted the shaded part of the shore while surfers and beach bummers swarmed the waters. 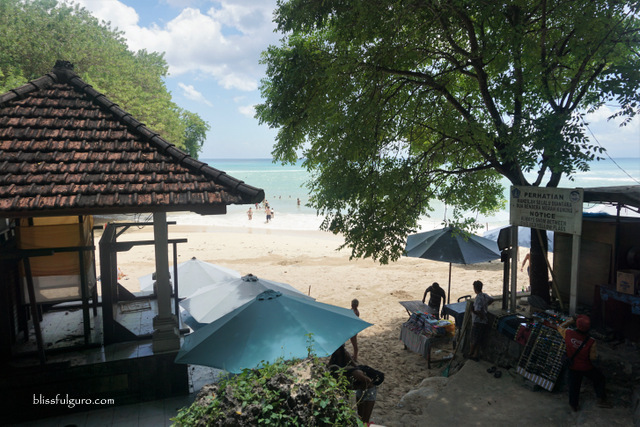 We had a decent lunch on a warung (eatery), grabbed several beach lounge chairs and ordered three Bintang Beers (10,000 Rupiah | US$ 0.75 each) while checking out the beach scene. After finishing the beers, we headed back to the resort. We could’ve waited for the sunset (which I heard was lovely) but opted to go back to the resort. 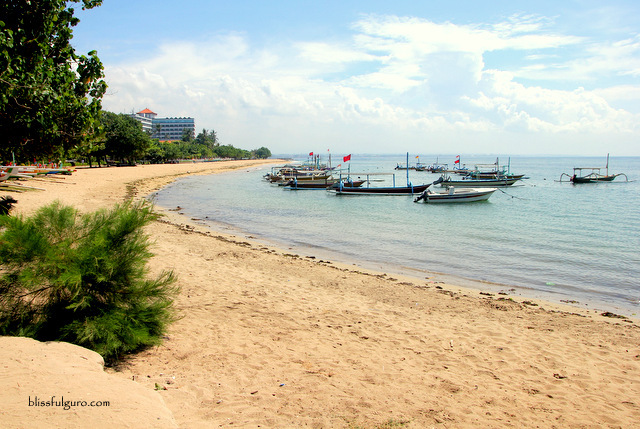 Next on our beach list was Sanur Beach located at the southeastern side of Bali. A 30-minute drive from the airport, it is along the coast of Denpasar City and one of the best places to catch Bali’s sunrise. Brilliant in the eleven-o’ clock sun, the coastline with golden yellow sand was swarmed with beach bummers who were enjoying basking under the intense heat. We entered a road leading to the beach and saw some hotels and restaurants lining the shore. Bike and surf board rental stalls as well as local eateries were also in sight along a narrow concrete path. 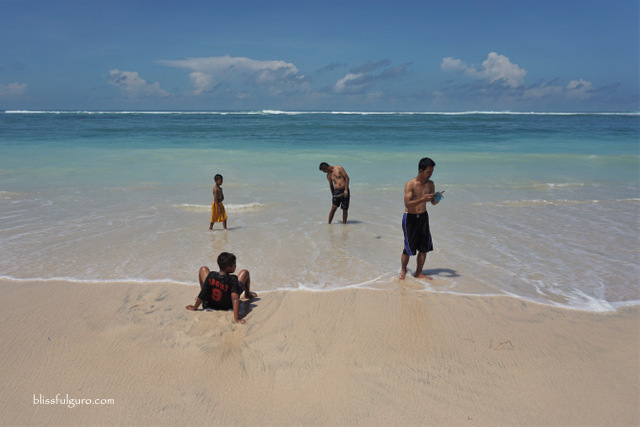 The ocean current wasn’t as strong as in Kuta so children were enjoying the waters. There’s also a coral reef some few hundred meters away from the shore so snorkeling is also one activity that you can enjoy here. Me and my buddies were not swayed to take a dip so we went ahead and explored more of the beaches in Bali. 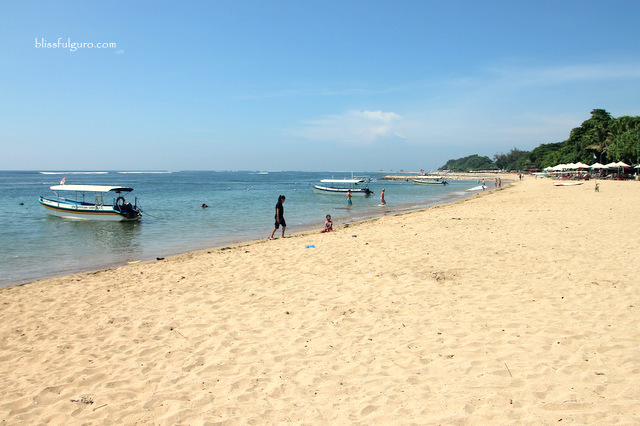 Next on the list was Nusa Dua Beach around 40 kilometers south of Denpasar City. 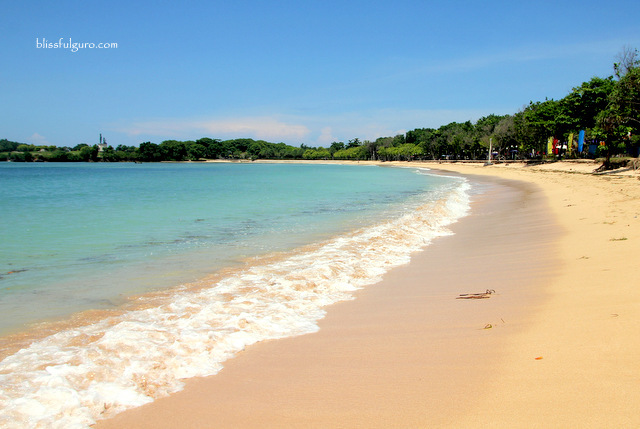 Nusa Dua was built in 1971 and became a famous hotel complex in Bali. 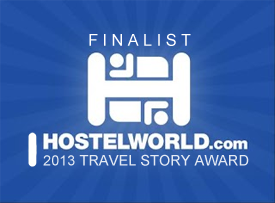 We entered a beautifully landscaped garden and went straight to the posh hotels on one end. We immediately went to the beach where some locals were enjoying their picnic on a shaded part while some tourists were enjoying the sun and getting that perfect tan. Moving on, we went ahead and passed by some wild mangroves and palm trees going inside a Balinese gate that revealed a better coast on the other side, and it was beautiful. I took a few snapshots then tested the waters. The clear turquoise water was refreshing and I waded like a kid on a hot afternoon sun, alone. I owned the beach for a while. I was unleashing my inner Arielle when a small jellyfish greeted me underneath. I panicked and ran to where my buddies were and never came back. It was a quick but fun swim nevertheless. 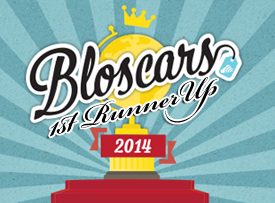 Coffee shops, warungs (eateries) and shower areas were spotted at the parking area. We feasted on local chow while being greeted by squirrels from the huge trees, I shrieked every time they went near me though. 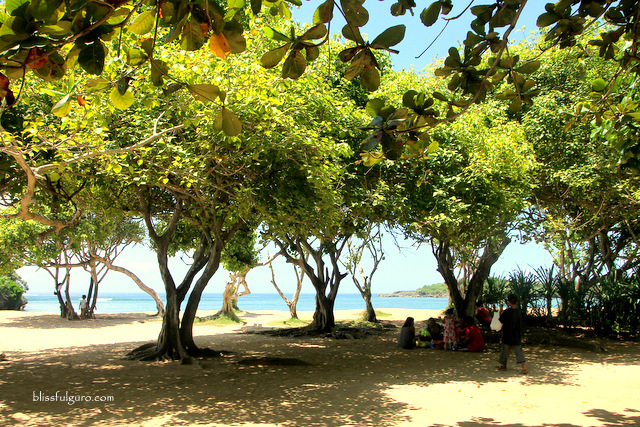 It was late in the afternoon when we went to our last beach destination of the day on the southeastern coast of Bali. 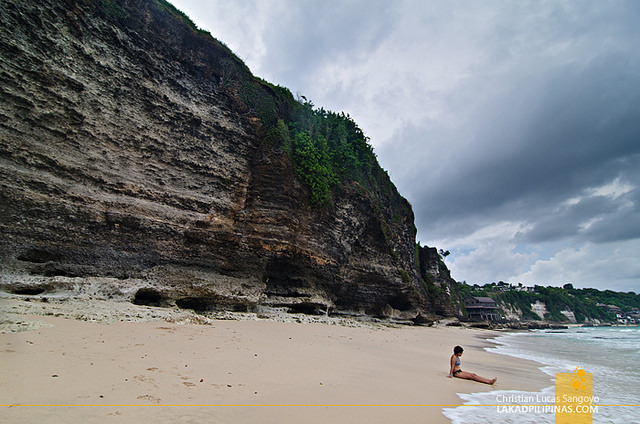 Dreamland Beach is on the way to Uluwatu Temple, one of the famous Hindu temples in Bali. A friend once informed us that an afternoon rendezvous at this particular beach was not enough, he said that you need a day or two. We entered a resort complex that used to be a popular holiday destination in Bali, which is not the case now. The place looked deserted, and although some hotels were still operational and some developments were ongoing the place felt like a ghost city. We parked somewhere (15,000 Rupiah | US$ 1.13 for the parking fee) and hopped on a free old school van that transported us to the steps leading to the beach. Souvenir stores and coffee shops lined the covered path and then at the end of the stretch were beachfront restaurants and bars; and then the beach. The sky was gray and Dreamland was at its most gloomy state. We walked further to the shore and noticed that beach chairs were everywhere. It was crowded though as both tourists and locals were lounging at the beach. Surfers and swimmers were enjoying the huge waves that almost wiped them off. We went to the leftmost side of the beach and spotted a huge hill with its stunning limestone cliffs covering a part of the shore making it look like a secluded cove. My buddies were having their photo sesh while I ran to the waters and went swimming as if there were no huge waves coming at me. I was having a hard time paddling and kicking but I loved it. I loved the struggle of going under a huge wave. And then it drizzled. We ran back to the shore and searched for a shelter from the shower but found none. So instead, we tucked our stuff inside our dry bags and enjoyed the drizzle while it lasted. It was fun, having that moment when we were just getting wet from the light rain. And I realized how lucky I was to find the perfect travel buddies who didn’t mind getting wet and shiz. After our chill out session at Dreamland Beach, we went back to our home in Ubud and had a sunset dip at the pool, as if the beach hopping all day didn’t suffice. Bali has so many beaches but each has its own beauty and splendor, you just have to find your happy beach and lounge the whole day. I think that the Philippines has some of the best beaches in the world. I’m being biased here, but no, I totally believe that we have beach gems tucked somewhere those 7,500++ islands. I digress. 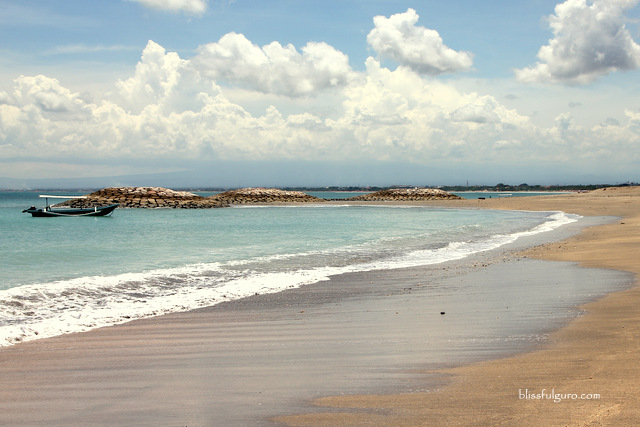 Being an island province, Bali is gifted with a number of stunning beaches, I suppose there are hundreds. 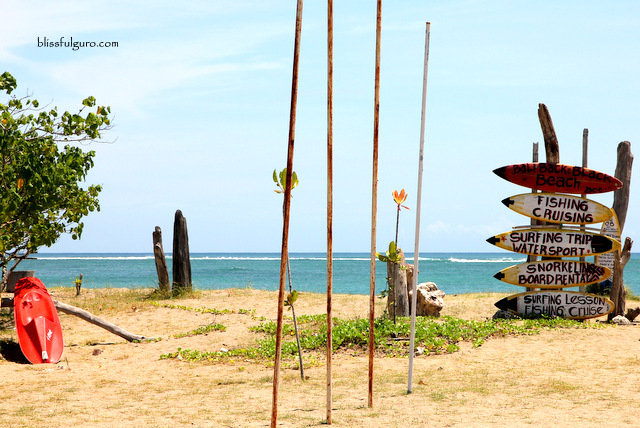 Whether for surfing or beach bumming, you’ll definitely find the perfect beach for you. And for the third time, we got the chance to explore new beach destinations. Me and my buddy started a new thing last year when we let our moms join us on the first leg of our annual two-month backpacking trip, that was in Malaysia. 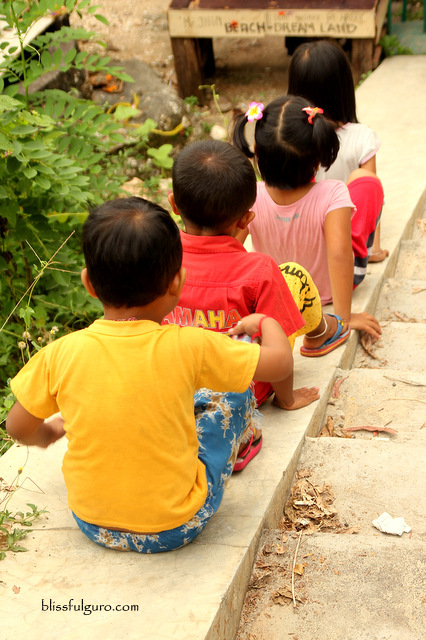 On this year’s trip, we started off at Bali and once again, we were with our moms. I’ve been to Bali a couple of times prior this trip (during ASEAN Summer Loop 2015 and Trip of Wonders) and I only have fond memories of the most famous island province in the whole of Indonesia. 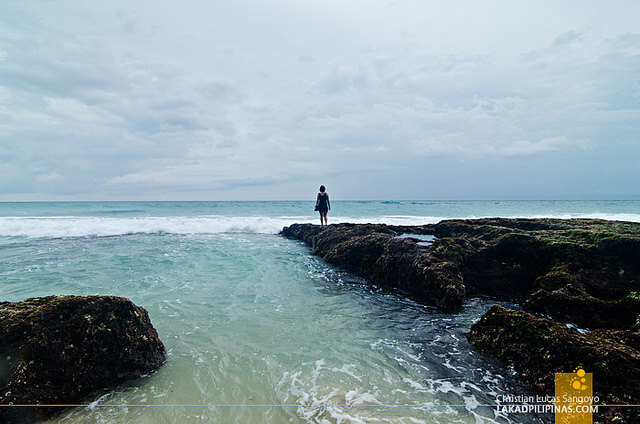 This time, we had ten days in Bali and we made the perfect itinerary of balancing leisure time and adventure. Me and my buddy just got hitched some months ago on a simple wedding in Zambales so it was sort of our celebratory trip right after our Australia honeymoonish trip. For our two-month summer backpacking trip this year, SEA 2 Africa 2018, we traveled to Southeast Asia—Bali, East Timor and Singapore—and Morocco in Africa; the latter was my ultimate dream destination and we spent 33 days in this wonderful country. We booked a private car with English-speaking driver online for ten days and we got to plan our own itinerary. It was our second time to charter the services from Bali Golden Tour and as always, we were pleased with the service from the company and the liberty to spend as much time on a given spot. Putu was assigned to be our chauffeur, including the airport pick-up and drop-off, and we loved how we got acquainted with Balinese life through him. 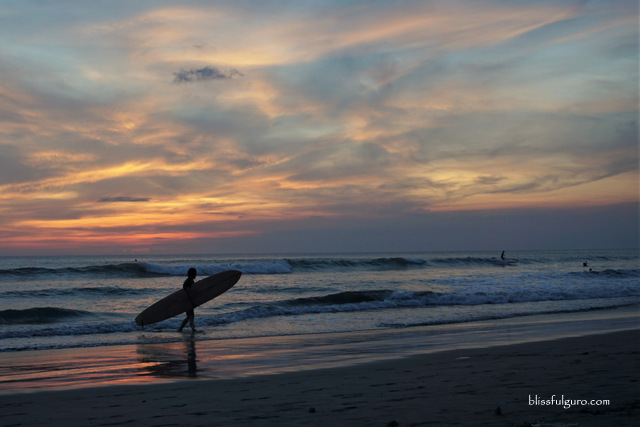 Bali is often a weekend getaway for Australians! 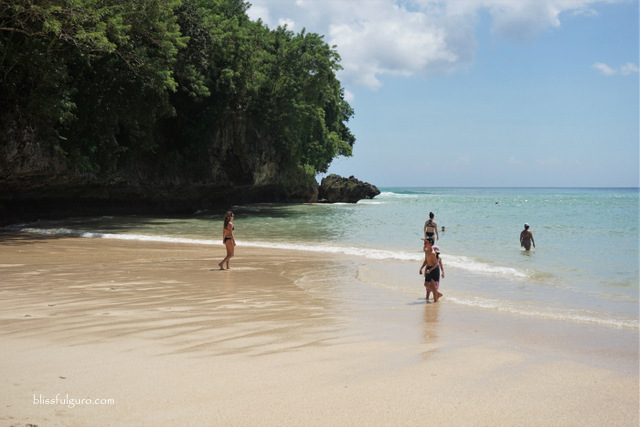 A trip to Bali wouldn’t be complete without exploring its beaches. I’m not expecting anything though as during our previous trips here, we checked out some but were kind of disappointed, maybe because the Philippines has breathtaking seascape that’s why we’re hard to please. Plus, we’ve been to the stunning Gili Islands and Komodo Islands of Indonesia. Nonetheless, we enjoyed our beach trips because we're in good company. The heat was unbearable as we jumped off our car. In a distance, it looked ordinary but when we got to the shore, I was stunned on the beautiful waves crashing into the powdery ivory sand. I saw some kids who were happily playing at the beach and a number of beach bums working on their tans. Locals dominating the tourists in this beach. At that point, I wanted to just dive into the water and stay there for a good one hour but my buddy motioned if we could at least stroll a bit further. We reached the western end of the beach where I immediately stripped off into my bikinis and jumped into the water. The waves were wild and I totally loved it! In the Philippines, people are free to go to the beach without paying a fee ‘coz it’s supposed to be a public property, this is not the case in Bali. The narrow stretch of the beach. We paid the needed fee to get in and climbed down a steep concrete stairs to where the beach was. There was nothing spectacular about this place. We didn't dare to swim. Not a happy beach for me. Sellers were around sharing the small cove with beach goers. We then realized that it’s a haven for beginners in surfing. After twenty minutes, we bounced to our next beach. Nunggalan Beach from a cliff. We didn't go to the beach though. I read from somewhere that there’s a beach that isn’t frequented by tourists, so I knew we had to go. 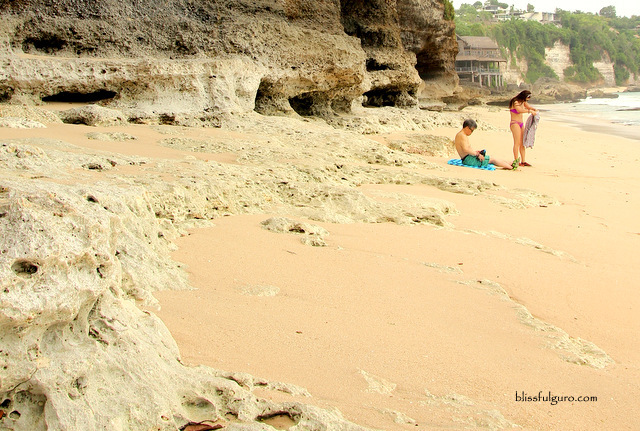 We went further down the southern tip of Bali for this elusive beach. Putu, our driver, wasn’t even familiar with the said beach. 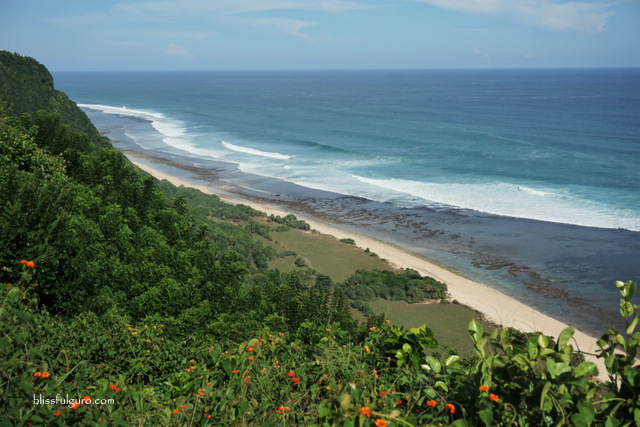 We asked around and finally reached a lookout where we saw Nunggalan Beach and the nearby Nyang Nyang Beach. Unpaved road going to Nunggalan Beach. No one was there but a lone staff on an empty horseback riding center. We thought of hiking down the hilly and rocky slope down the beach but then we were pressed for time. My favorite beach on this trip. Endless shops and cafés bordered the edge of the cliff. There were no signs pointing to the beach but we figured out that we just had to follow where the people were heading. The maze-like vertical structure was reminiscent to Jiufen in Taiwan where me and my buddies happily got lost on its steep alleys. Blue Point Beach is surrounded with shops, cafes and chill spots. We somehow managed to arrive where we wanna go and saw a number of surfers getting ready for an afternoon ride. 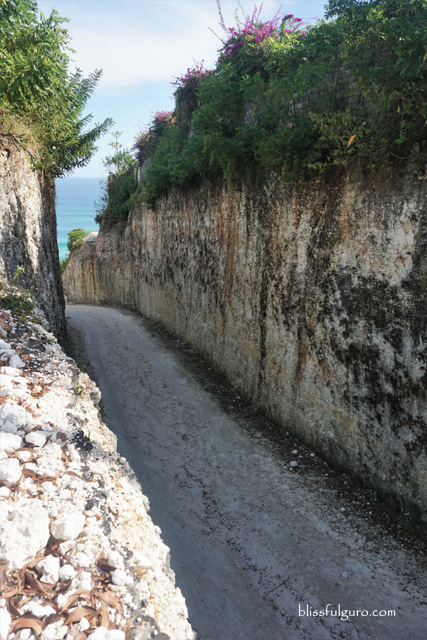 There are two paths going to the beach and we chose to go to what seemed to be a cave entryway. 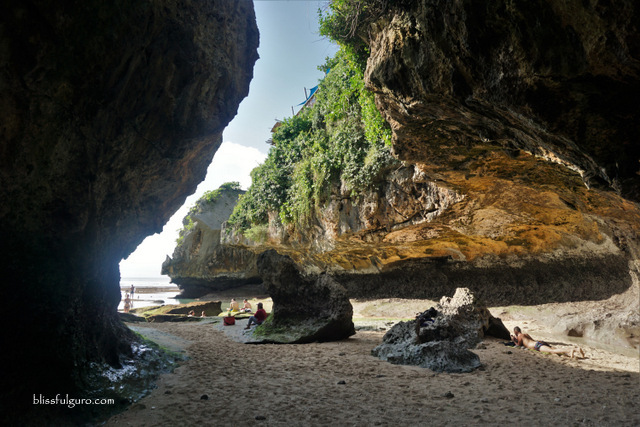 We squeezed into a tiny opening of a cave and were stunned when we surfaced to the beach. 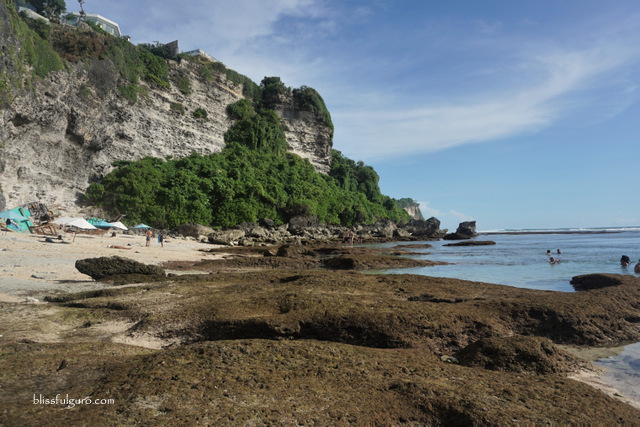 Blue Point Beach was dotted with limestone cliffs with natural pools around. The climb down was scary but worth it. With our moms, we chose our own pool and soaked into it, a therapy of some sort. Wading like kids, we spent the whole afternoon on our newly-discovered paradise. 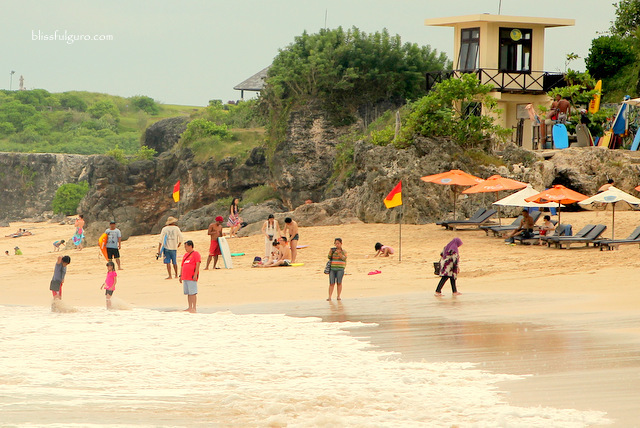 Of course, we needed to show our moms one of the famous beaches in Bali, the Kuta Beach. Their reaction was like mine when me and my buddy went there for the first time, I was surprised to see a public beach with gate and fence, although it was tastefully done. Beer and snack shacks, surfboard rental stands, beach chairs and whatnots. We spent around ten minutes until my mom got tired of the scene, she’s not as thrill-seeker as me. 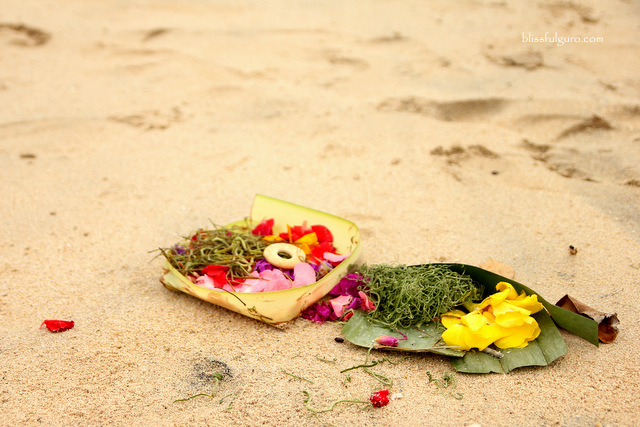 No major setback was recorded, my mom and I had petty quarrels (which is normal) but resolved it right away, we got to explore on Balinese yummy dishes with the measly budget we had, and we once again filled our memory buckets with fun times. Agree ako diyan Teach, since hindi ko afford balik-balikan ang Maldives Lol. Philippines has the best beaches. I miss Dreamland the current was strong diyan marami nagsusurf. Pero ang linis din ng tubig.